The Change One Diet is a weight loss program from prolific publisher Reader’s Digest. The content is authored by some of their leading health and nutrition writers. The plan originally appeared in the book Change One: Lose Weight Simply, Safely, and Forever: The Breakthrough 12-Week Eating Plan from Reader’s Digest, and received very favorable reviews (typically 5/5). Reader’s Digest have now come up with a complete on-line format containing all the advice from the book plus additional tools. 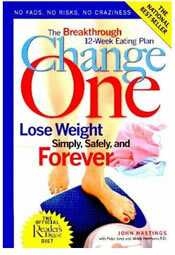 The name “Change One” comes from the idea that you make a single change to your lifestyle and diet each week. There are no restricted food groups as such, and the diet is simply a balanced plan based on an “optimal” caloric intake for weight loss. It’s a refreshing break away from the “bad/naughty” foods point-of-view that causes so many dieters to binge or fail. The Change One plan can range in cost from $8.33 per month up to $14.95 per month. This depends on how long you sign up for. As far as costs go this seems reasonable, considering the amount of tools and support they provide. Signing up for 12 months is by far the best option – the price is almost halved, and it proves you have made a long term commitment. The idea of gradual change is appealing. This may give you more of a chance of sustaining the fat loss over the long term and keeping up with good eating habits. Too many weight loss programs require drastic changes to diet – which have an effect over the short term — but think to yourself — “can I imagine still eating like this 10 years from now?”. Change One have all the tools, support, and community offered by most other online programs, but the subscription costs compare very favorably. The online version of this diet has been discontinued.